Why wait to get home to HotSync, check your e-mail, or get the latest news and stock updates? 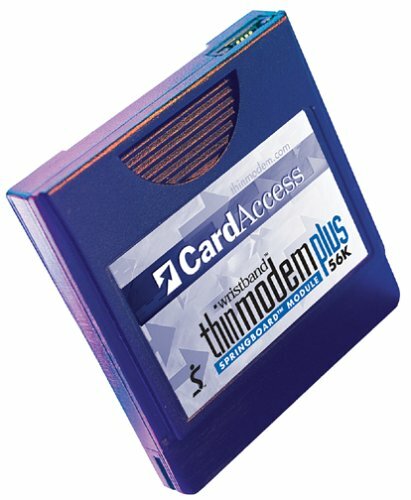 The CardAccess Thinmodem allows you to turn your Handspring into a fully functional Internet computer when you're on the road--without adding bulk and hassle. With the CardAccess Thinmodem Springboard Module, you can link your Handspring handheld computer to the Internet via any phone line. The size of a matchbook, this hardwired modem connects you to a phone line at 33.6 Kbps for quick and painless Internet access. It's also easily upgradable to the 56K V.90 modem protocol for ultrafast downloads. Designed to slip easily into your Handspring's Springboard expansion slot, this tiny modem needs no setup or configuration and is fully removable. Its energy-efficient design is a minimal drain on your Handspring's batteries, and it won't take up any RAM memory space on your Visor. The Thinmodem is compatible with the Handspring Visor, Visor Deluxe, Visor Prism, Visor Platinum, and Visor Edge models. It measures only 2.25 by 2.125 by 0.30 inches--and since it barely increases the profile of your Handspring, you can still use most cases. The Thinmodem comes with onboard HotSync, e-mail, and Web-browsing software for easy connection to your Internet provider. It's color compatible, and you can view the Web on a Visor Prism with the included 16-bit color Browse-it 1.0 browser. The Thinmodem also comes with MultiMail for checking e-mail. The software is plug and play--no downloads or configuration are necessary. Just hook up your modem and get ready to surf. A 6-foot phone cord with male RJ-11 connector is included for easy hookup. View your modem status on your Visor's screen with real-time data rates and connection status. A battery indicator display tells you when you're running low on juice, and the modem sounds a call-in-progress speaker tone as it connects. I also have a Visor Deluxe which I have used with a Targus Stowaway Keyboard. The modem connection while seated on the Stowaway Keyboard allowed me to review emails and respond to them without disconnecting either the modem or the keyboard. This combination relieved me of the burden of a laptop while traveling. Unload the prepackaged software (the email program is only a demo and requires a fee for use) and use the 500K storage for something else, which is a plus. Eudora Internet Suite is free. I received an email from technical support that the upgrade to V.90 will include fax support (the current version does not permit faxing through the ThinModem). The battery meter dips during use but restores, for the most part, after turning it off. ThinModem comes with a male telephone jack (about 36 inches) which works well in airport telephones that offer a female connection. For about $5, get the female jack (about 4 inches)which works better with connections will working at a desk. One negative is the current lack of a gadget to connect to a cell phone to turn the Visor into a wireless, but that may come, I hope. I got my Thinmodem [and it] is a great deal! Anyways, it performs great. The only two drawbacks are that 1) even though i have flashed it to the latest version that supports 56k, mine connects at 28.8. I have emailed the company inquiring about this though. 2) It requires a special adapter to connect rather than the standard RJ-11 plug plugging directly into the springboard. Therefore, I can't simply carry around my visor. If I intend on using the modem, I'd have to take an extra cable which i tend to forget to do. It really comes in handy to be able to check email, browse the web, and even get on AIM when I have access to a phone line away from home. My Thinmodem works great but I had some difficulty with Blazer and other web and mail programs. When I found Eudora, however, I deleted all those other modem programs. Eudora works easily and is easy to learn; it has better features than Blazer and is free. If you're satisfied with your modem programs, good for you, but if you haven't chosen modem programs, try Eudora. I use this adapter more than the cable that came with the Thinmodem. When traveling, I don't always have a jack to plug into. It's much easier to find a phone that I can unplug the wire from the phone and connect to this adapter. Also, most telephone jacks are usually mounted near the floor and are usually difficult to get to. Again, it's usually easier unplugging the telephone wire from the phone and plugging into this accessory. Plus, when I don't have a phone line to plug into, I can use my Konexx Koupler and attach to a payphone. It's more convenient using this accessory then using the cable that comes with the Thinmodem and an inline phone extension adapter to allow me to plug in the accoustic adapter. One problem is don't carry it in your pants pocket. It was convenient to carry it with me in my front pants pocket. I guess the constant bending and moving has stressed the wire going into the connector and mine has developed a short after only a couple of months of usage. It still works, but it's becoming very difficult to position the wire to make it work so I'm having to buy another one. Not sure when I will use this but might be nice to have. The next best thing to wireless Internet access for your Handspring Visor is CardAccess's Wristband Thinmodem Plus, a 56K modem that packs an extra 7.5 MB of flash memory storage into the miniscule module. Unlike other modems, the Thinmodem Plus fits snugly into the module slot, with nothing hanging over the edge--meaning you can keep the module in for its storage capabilities and easily sheathe your Visor in its carrying case. The modem beeps when inserted, to let you know the hookup has been completed. Then the 6-foot phone cable connects to the modem--unfortunately the connection was so tight that tugging the cable out sometimes pulled the module out of our Visor. Most of the configurations are simple--enter the dialup number for your ISP, as well as login name and password, and you then connect. Some ISPs required minor workarounds: for example, our MSN account needed "MSN/" inserted before our login name. Note that because AOL and Compuserve use proprietary browsers, users of these ISPs can only connect to these accounts for checking e-mail, not browsing the Web. The registration process for the bundled BrowseIt software took quite a few steps and we were forced to enter our username and password several times. But once we had everything entered in, browsing was simple. We could use the bookmarks (as well as add our own), or enter any URL. Although the Thinmodem Plus promises low power consumption, it still drains the batteries rather rapidly. Its connectivity is best for e-mail grabbing and synching up with sites for offline viewing more than long-term Web site browsing. The storage side of the Thinmodem Plus works simply and smoothly. The included FileMover application lets you easily transfer files from the Visor to the module or vice versa. It's a useful extra for the module--who can't use more storage space on their handheld? An excellent product, but as stated in the review above, the software that was included did not work. This was easily fixed --- go to Eudora.com, and use their FREE software. The PDA works as good as a laptop for email and nearly as good for web browsing. Incredible, a modem that is so small and working faster than a PC modem (even if the Baud rate does not reflect this). However, the "Browse It" web browser is not functioning anymore so you have to find another web browser. Luckily, "Avant Go" and "Eudora" both offer free options for this. Up to now (March 2002) this modem has official approval only in a few countries, e.g. the US, but it appears to be working very well also in Guatemala and the Netherlands. In my experience the support service took a long time to respond but their answer was adequate. I am addicted to e-mail! I admit it! So when I go out of town or if I am on the go...I NEED TO CHECK MY E-MAIL! This card was easy to install and all I had to do was follow the simple step by step on screen instructions. I also downloaded software from my provider that was immediately installed during my next hot sync. I don't browse the internet on this...haven't tried either. But I have used it to gain access to email and instant messaging. I highly recommend this if you are like me..and have to stay connected. This is an excellent module for a Handspring Visor. I got this for my fiancee' for his birthday. It is the only 56K modem available for the Visor and it is the smallest and lightest modem of all. Its additional 8MB of memory makes it even better. The only flaw I saw with it was the browser software it came with did not work well at all. We had to go on Handspring's site and get a different browser. But as far as functionallity and ability, I highly recommend this modem.